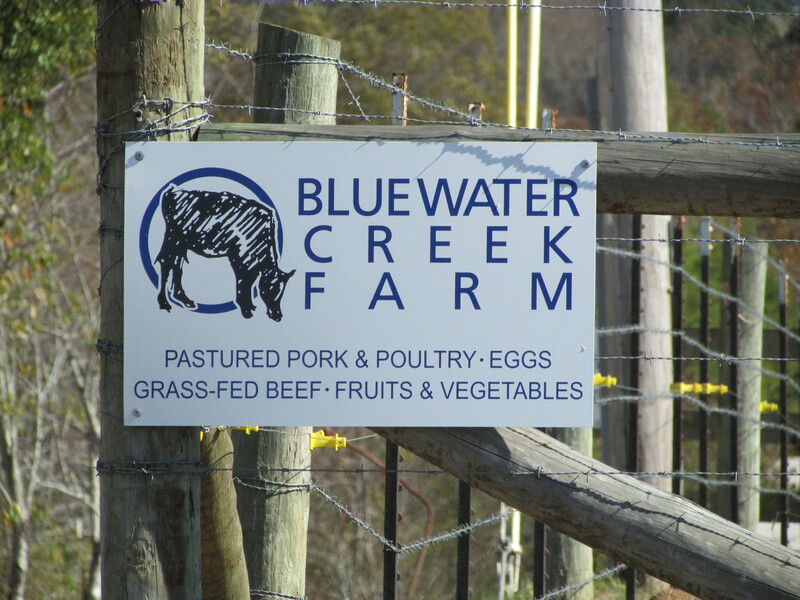 Bluewater Creek Farm (www.bluewatercreekfarm.com) is a family-owned sustainable farm near Killen, Alabama, in the Shoals area of the far northwest corner of Alabama. It is run by Liz and Collins Davis in partnership with Liz’s parents, Donna and Doug Woodford. Today I drove over there for the first time to check out today’s farm stand and to join a tour of the farm led by Liz. The more time I spend in the Shoals lately the more I’m convinced that it may be the center of the universe. I was unaware of Bluewater Creek Farm until August when I was in the Shoals — in Florence — for my second “Friends of the Café” event at the Alabama Chanin Factory. We were lucky enough to sit across the table from Donna and Doug who enthusiastically told about their family and granddaughter Abby. They were thrilled that Liz, Collins, and Abby had recently returned from northern California to start Bluewater Creek Farm. Collins had run farms in California and other places and now they are back in Alabama. Doug, who is a physician and advocate of holistic nutrition, spoke passionately about his and Liz’s work in nutritional therapy, and Doug and Donna enthusiastically shared news of the activities on the farm as well as pictures of Abby. Doug also had impressive pictures of chickens and bulls from the farm. What impressed me most was the passion and commitment with which this couple discussed the work they and their family are doing. This family makes a convincing case for their philosophy and seeing the labor-intense way in which they practice what they preach drives home the benefits and sanity of their cause. 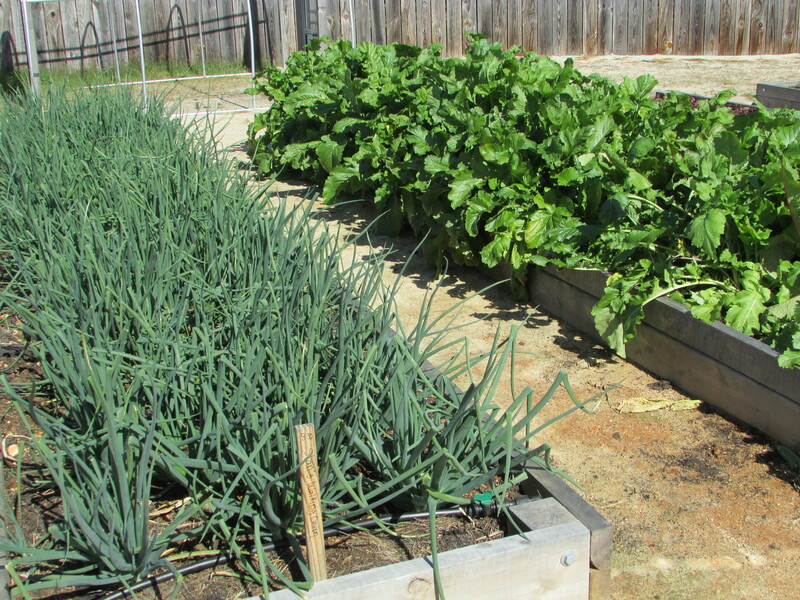 I, like most Americans, have only fairly recently become educated to the benefits of the “slow food,” “No Farms, No Food,” and “Eat Fresh, Eat Local” movements. It is this rising consciousness and education of the general public which has led to the emergence of great local farmers’ markets in virtually every community, to locally owned restaurants serving locally grown foods, to an understanding of why these issues increasingly matter, and to more sustainable farms like Bluewater Creek. Previous generations knew this first-hand. Most Americans of the 21st century are learning it anew. Availability nurtures advocacy. Liz’s tour included the planting beds, still full of lush greens and root vegetables on the first day of November (after the first truly cold night of the season); a visit with the farm’s heritage pigs, including a bunch of tiny piglets; cattle in the pasture, including the grass-fed, heat tolerant South Poll breed; and a bunch of happy grass-fed chickens, joined by a lone turkey (it’s close to Thanksgiving; I didn’t have the heart to ask). When the tour was over, I continued down the path to Bluewater Creek. I never lived on a farm and have spent minimal amounts of my life in the country and around farms. Yet I find, especially lately, that being alone out in nature gives me a peace and sense of ease that I don’t get in any other environment. It has become my best and most reliable form of release. Before leaving Bluewater Creek Farm I stopped by the Barn, a converted horse barn now used for events and classes, to visit for a minute with Donna. This was the location of the farm stand with the farm’s various products being sold. I bought some meat, peppers, beets, and beet greens to supplement what I had already gotten at my local farmers’ market a couple of days ago. I also got some honey that had been jarred today. I was too late for eggs. They had just sold out. That’s okay. I’ll be back. 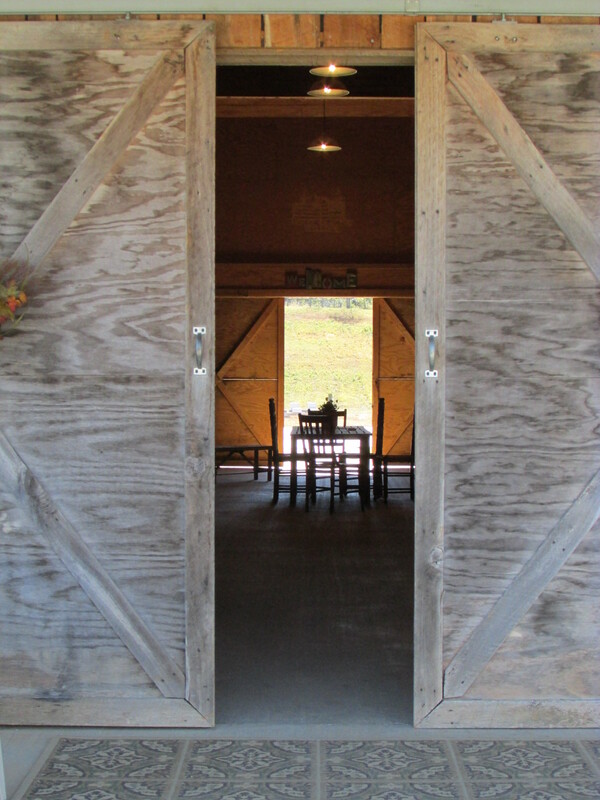 This entry was posted in Alabama, food and tagged Alabama, Bluewater Creek Farm, Donna and Doug Woodford, food, Liz and Collins Davis, southern foodways, sustainable farming, the Shoals, the south on November 2, 2014 by gedwardjourney.